The whole sign house system is a method of house division that uses the rising sign as the first house, and then the rest of the houses are assigned to each of the signs in zodiacal order, with each of the twelve houses exactly coinciding with each of the signs. For example, if the Ascendant in a chart is located in the zodiacal sign of Cancer, then the entire sign of Cancer becomes the first house. After that, the next sign in zodiacal order, Leo, becomes the second house, the sign after that, Virgo, becomes the third house, and so on. In the whole sign approach the degree of the Ascendant does not necessarily mark the beginning of the first house, but instead it simply designates the sign that becomes the first house, and the beginning of that sign then acts as the cusp of the first house. This is true even if the Ascendant is very late in the rising sign, so that for example with the Ascendant at 29° Cancer the beginning of the first house would still be at zero degrees of Cancer. 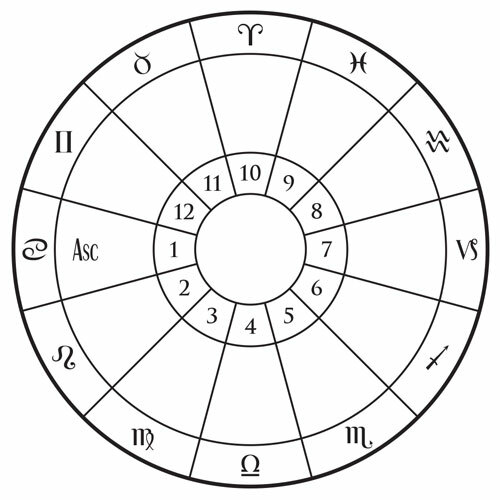 The whole sign house system was used in ancient Hellenistic and Indian astrology, and it seems to have been the oldest and most popular form of house division in those traditions. Knowledge of this system was lost in the western tradition sometime during the Middle Ages, but then it was rediscovered in the 1980s and 1990s and became popular again in the first two decades of the 21st century. In the Hellenistic tradition the whole sign system was sometimes used together with pieces from other systems of house division in order to create a hybrid approach. For example, the 2nd century astrologer Vettius Valens mentions using the degree of meridian, which is the Midheaven in quadrant house systems, as a sensitive point that floats around the top half of the chart and imports tenth house significations into whatever sign it falls, merging them with the significations associated with that whole sign house. Elsewhere, other Hellenistic astrologers seem to have used whole sign houses for assigning topics or areas of life, but they would switch to quadrant houses or equal houses in order to determine angularity or planetary strength within the context of certain techniques. By the later Hellenistic tradition circa 500-600 CE astrologers such as Rhetorius of Egypt seem to have used a hybrid approach with whole sign houses and quadrant houses as a secondary overlay. Brennan, Chris, Hellenistic Astrology: The Study of Fate and Fortune, Amor Fati Publications, Denver, CO, 2017. Hand, Robert, Whole Sign Houses, the Oldest House System: An Ancient Method in Modern Application, ARHAT Publications, Reston, VA, 2000. Hand, Robert, “Signs as Houses (Places) in Ancient Astrology,” Culture and Cosmos, vol. 11, nos. 1 and 2, 2007, pp. 135–162. Holden, James Herschel, “Ancient House Division,” American Federation of Astrologers Journal of Research, vol. 1, no. 1 (August 1982), Tempe, AZ, pp. 19–29.